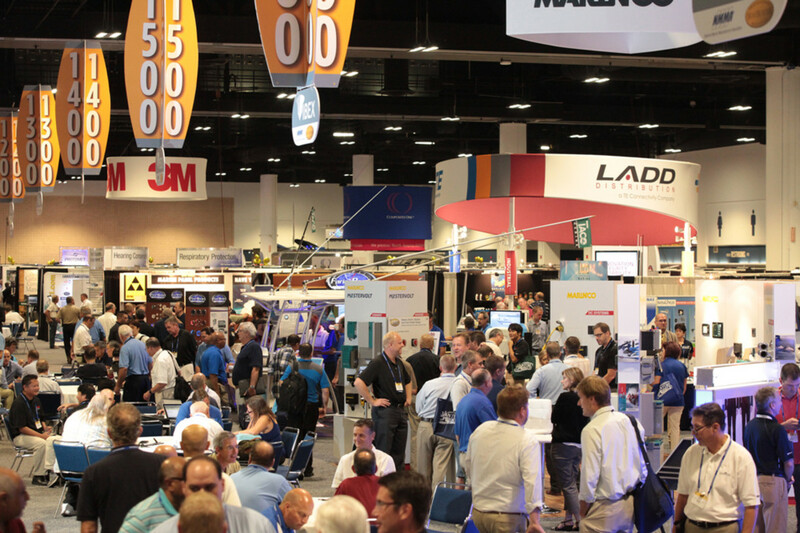 TAMPA, Fla. — IBEX show director Anne Dunbar reported a 47 percent increase in the number of industry professionals who attended the 24th annual International BoatBuilders&apos; Exhibition & Conference at the Tampa Convention Center. Dunbar said in a statement that the IBEX team had been feeling positive all week about the strong attendance. Along with a 34 percent increase in exhibitor pre-registration and a 43 percent increase in the number of companies that entered products in the Innovation Awards competition, the numbers were all looking up for this year’s conference. "It was the best IBEX show I have ever attended, and I have been to all of them for the past 12 years," Blue Sea System senior vice president David C. Johnson told Trade Only Today this morning. "I thought the venue was perfect — to have boats only a short stroll away, I thought, was exceptional. We had customers from New Zealand to Sweden and every significant boating state in the country, and they all had a positive vibe about the industry and the event." The exhibit hall included 80 first-time exhibitors and the total number of IBEX exhibitors was 17 percent higher than in 2013. There were on-the-water exhibits and live on-the-water demonstrations this year for the first time. A day-to-day breakdown of attendance numbers and final verified numbers will be available next week. More than 15 companies, including propulsion manufacturers, electronics manufacturers and helm and steering manufacturers secured slips with boats, Dunbar said. “With a strong economy and such a successful event, we are confident that the 2015 event in Louisville (Sept. 15-17) will be strong as we bring the industry together to celebrate our 25th anniversary," she said. The conference opened Tuesday morning at the Industry Breakfast with a state-of-the-industry address from National Marine Manufacturers Association president Thom Dammrich. Dammrich identified the two most important factors that affect the marine industry — weather and Congress — and encouraged industry members to get involved in political initiatives that are important to boaters, such as the ethanol debate, sportfishing regulations and all of the issues that surround the pending reauthorization of the Magnuson-Stevens Fishery Conservation and Management Act. He stressed the importance of social media in marketing campaigns, specifically online video content, and revealed that the NMMA’s Stories of Discovery campaign had received more than 7 million views. Discover Boating’s sponsorship of country star Jake Owen’s Days of Gold concert tour drove 1.75 million people to Discover Boating’s website, Dammrich said, and he welcomed IBEX conferees to meet Owen during a happy hour event on Tuesday at the convention center. Innovation Award winners were announced at the Industry Breakfast. A record-setting 88 products were entered in 13 categories, a 43 percent increase in entries from 2013. "IBEX did a great job marketing the Innovation Awards and helping exhibitors and companies understand the benefit of competing in the Innovation Award process," said Zuzana Prochazka, the awards chairwoman and a freelance marine writer and photographer. The largest concentration of Innovation Award entries was in the mechanical systems, deck equipment hardware and OEM electronics categories. Other award categories included boatbuilding methods and materials; inboard and outboard engines; interior parts and furnishings; boatyard and dealer hardware and software; and safety equipment. Seven judges, including Prochazka, arrived two days before the show opened and spent hundreds of hours examining the impressive field of nominees. Other awards presented at the breakfast included the 2014 Marine Industry Customer Satisfaction Index Awards and the Exhibitor Video Awards, or EVAs, honoring the best product and company videos submitted by IBEX exhibitors. The Best Company Video Award was presented to Marinco/Mastervolt. The Best Product Video Award and the People’s Choice Award were presented to SeaStar Solutions. The Boating Industry Mover & Shaker of the Year was presented to Jim Lane, president, and Buck Pegg, founder of Chaparral Boats and Robalo, who have embraced change and adapted to today’s radically different boating industry. The Mel Barr Award, which honors a person who has contributed to the improvement of the marine industry through personal involvement, was presented to Zach McLanahan, aftermarket sales manager at T-H Marine Supplies. IBEX’s exhibit floors, docks and the outdoor demonstration areas attracted large crowds on all three days of the conference. The floor area featured more than 550 exhibitors. The total number of exhibitors was 17 percent higher than in 2013. Special sections in the exhibit hall included The Connected Boat, an interactive exhibit sponsored by Simrad-Navico that featured a dozen companies showcasing products that connect onboard boating systems to smartphones and home computers. Joe Burke, chief technology officer at Chetco Digital Industries and IBEX’s creative partner in the Connected Boat exhibit, demonstrated how new products such as Chetco’s SeaSmart Pro, a next-generation vessel Wi-Fi network adapter, connects a boat’s data systems to the cloud. A wide variety of onboard systems from Honda, Blue Sea and Garmin can now connect to “off-board” boaters’ smartphones and computers, using cloud technology. Exhibitors at Material ConneXion in the Composites Pavilion in the exhibit hall took advantage of the crowds to decode some of the technical properties, innovative traits and suggested applications of more than 7,500 cutting-edge materials. “Seven out of 10 companies attending IBEX base their purchasing decisions on what they see at the conference,” Dunbar said. The 3-D workshops also drew large crowds throughout the conference. DRS Technologies and RhinoFabStudios held live demonstrations of 3-D printers, 3-D scanners, laser cutters and CNC machines. Honda, Mercury, Simrad and Elco were just some of the companies that had boats in the water rigged with their products. Mercury was showcasing its 250-hp, 4.5-liter gas sterndrive, its first in-house-built gas engine, and its new 90-hp FourStroke. Elco installed a diesel/electric hybrid propulsion system in a 34-foot trawler from Beneteau. The system teams a 425-hp Cummins diesel and a 20-hp Elco electric motor. Back inside, Elco was presenting for the first time its new 5- and 7-hp electric outboards. — Executive Editor Chris Landry also contributed to this report.